Sister Joan Lin, of the Daughters of Charity of the Caonssian Institute, died and returned to our heavenly home on the afternoon of 27 April 2012 at the age of 93. Born in China on 3 September 1918, Sister Lin joined the Canossian religious family on 8 September 1939, making her religious profession on 12 September 1942 and her perpetual vows on 6 January 1948. Her main ministry was education. She was taught and was principal at Sacred Heart Canossian School, Caine Road; Pui Tak Canossian School, Aberdeen; St. Mary’s Canossian College, Tsimshatsui; St. Francis’ Canossian College and Holy Family Canossian School, Kowloon City. 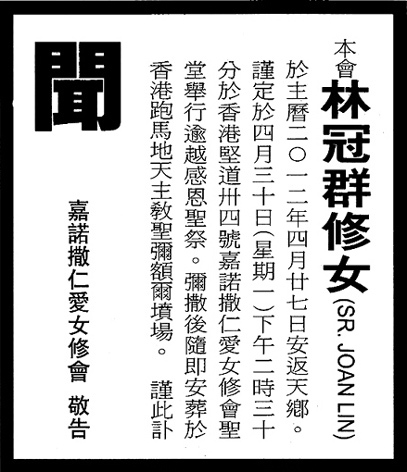 She also taught at Sacred Heart Canossian College, Macau between 1975 and 1985. In August 1985, she returned to Hong Kong to offer her services in the community of Quarry Bay. Her she kept contact with the staff and students and shared her life with them. In August 2001, she retired to the infirmary where she continued to offer her prayers and sacrifices everyday, burning brightly in God’s love until the end of her life. Let us thank the Almighty and Merciful God for the gift of Sister Lin, we pray for the repose of her soul that she may have a share the happiness of heave.